Lasting from 300 million years ago to 250 million years ago, The Permian Period is the final period of the Paleozoic Era. During the period, the Earth was divided into huge areas of land and ocean. Most of the continents of the world, except for Asia, had been fused together to form a giant supercontinent now known as Pangea. This enormous landmass stretched from the south pole all the way to the north pole. Surrounding Pangea was a gigantic ocean known as Panthalassa. To the east of Pangea was Asia and between Pangea and Asia was the Paleo-Tethys Sea. To the east of Pangea and to the south of Asia was the Tethys Sea. Weather during this period varied greatly. At the beginning of this period, the Earth was in an Ice Age that had begun during the Carboniferous. 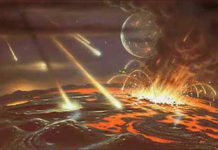 By the mid-point of the Permian, however, the climate began to warm gradually. The caused the glaciers to recede but also dried the interiors of the continents. This drying would continue throughout this period until there was a cycle of cool and warm cycles by the end of it. Life during this period was diverse and continued to expand. Some of the life that existed were plants and animals from the Carboniferous that continued to flourish in this new age. Others, however, were new radiations of life that were just beginning to take hold. 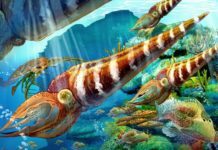 Marine animals that existed during this time include mollusks, brachiopods, ammonoids, fusulinids, and echinoderms. Terrestial life that existed during this type includes a variety of tetrapods, vascular and non-vascular plants, arthropods and fungi. Conifer groups also took hold during this time on the prehistoric timeline, as did some cycads and ginkgo plants. Insects also began to gain prominence during the Permian Period – cockroaches, specifically. Primitive cockroaches started to evolve during the end of the Carboniferous Period and became quite successful during this period on Earth’s timeline. They had four folding wings; well-developed eyes, six legs, an olfactory antennae system, an exoskeleton and could eat both plant and animal matter. Scientists estimate that these primitive cockroaches made up about 90% of all insect species at this time. The other 10% of the insects that existed during this time were beetles known as Coleoptera, true bugs known as Hemiptera and dragonflies known as Odonata. 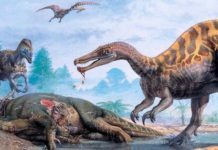 Some of the animals which thrived during this time were diadectes, amphibians and pelycosaurs. Around the mid-point of the period, primitive therapsids developed, including dinocephalia. Towards the end of the period, these primitive therapsids became more advanced and eventually spawned gorgonopsians and dicynodonts. Archosaurs would begin to rise up during this time as well. The early relatives of mammals, known as synapsids, also began to thrive during this period. 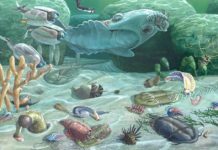 Not all life thrived during the Permian Period, however. 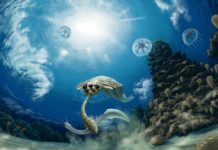 By the end of this time period, trilobites went extinct by the end of this period and many of the trees from the previous period – such as Sigillaria and Lepidodendron – were replaced on the interiors of the continents by early conifers and seed ferns. And this period would really end with a bang thanks to the Permian-Triassic Extinction Event (also known as the Great Dying). This event is estimated to have killed off anywhere from 90-95% of all marine species and about 70-75% of terrestrial animals. 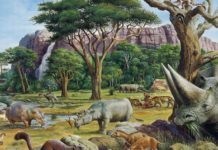 Scientists aren’t exactly sure what caused this mass-extinction but they do have several theories.